The Ray Charles Biography answers the question: how can a blind cat born poor make a style of music larger than it was before he stepped on the scene? Grit and determination! That's how... and Ray Charles was that sort of dude! The Ray Charles Biography starts with Ray Charles birth on 23 September 1930, in Albany, GA. in a very poor family. His father's name was Baily Robinson who worked as a mechanic and also a handyman, and his mother Aretha, worked in a sawmill. He was born during the period of Great Depression, as he wrote in his autobiography, his family was very poor even compared to other poor black families around. During the ongoing Depression period, his family moved to Greenville (when he was just an infant). Even when his family was living in great adversities, Ray enjoyed the early days of his childhood. He was interested in music right from his childhood, one source of his interest was a cafe owner who played piano and also showed interest in teaching it to him. Till 5, he felt like a happy child until when he lost his younger brother who drowned in a water tub. After that accident, Ray suffered from a gradual loss in eyesight, which left him blind by the time he was seven years old (it is said that the reason of his blindness was GLAUCOMA). As Ray was still a little child, when he was losing his eyesight gradually, his mother helped him in becoming self-dependent, she taught him how to do things, how to manage his work etc. 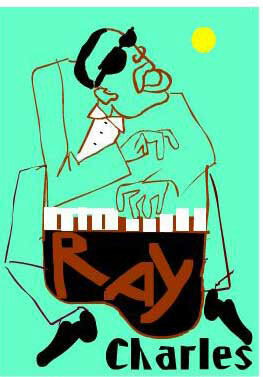 Ray was further admitted to a School for the Deaf and Blinds in Saint Augustine, Fla., where he learned music, composing, reading, and writing in Braille. He also learned instruments like piano, trumpet, sax, organ etc. Studying whole day, practicing music and listening to blues, country, gospel, jazz and some of the big bands of that time became his routine. At 15, after his mother's death, Charles left his school and joined a group of musicians who toured the South and performed at various places. Ray performed everywhere the group went and never paused or took a break from the hectic schedule. When he was on tour, he met Quincy Jones in a district in Seattle, Washington who became his friend for lifetime and they worked together on many projects. The first recordings of his life were published in Tampa, Florida in 1947. Further, Charles formed a group, which was called McSon Trio and moved to Los Angeles where they released several of their albums and singles, which were some of the big hits of that time. In 1953, Charles' first commercial record was published which sold about a million copies. In year 1954, Charles published his one more record called 'I Got A Woman', which was ranked #1 in R&B Charts till the year 1955. Charles had developed his own style in which he mixed various musical genres. He also began singing in his own emotions without following the style of Nat King Cole whom he followed previously. Ray was soon on his own giving the best he could, the results of which were some of his finest creations such as: Doodlin' (Part I and II), Hornful Soul, Rockhouse (Part I and II), The Ray and The Sweet Sixteen Bars etc. For next few years Charles continued giving smash hits one after another, he also joined hands with some of the best personalities of music world to give an ultimate combination and genius performances. Charles reached the pique of his popularity and ruled the charts continuously during this time. His albums 'The Genius Hits The Road', 'I'm Movin On', 'The Genius of Ray Charles' etc. are some of the best of his creations. Charles also won a couple of Grammy Awards during 1960-61 period before his next move to present country music in his own style, which was unexpected but was liked by people very much. By 1964, Charles became a nation hero and an icon of success. Near end of 1964, Charles was charged with the allegations and was arrested for carrying drugs in a Boston Airport. He also was arrested earlier for possessing drugs in Indianapolis and Philadelphia. Within a year from that time, he got himself admitted in California Sanatorium to fight and overcome his drug habit and in the late 1965 he came up with a country hit 'Crying Time' which won two Grammy Awards. Further in December 1966, Charles was convicted of the allegations on him and was given a 5 years suspension. From this time onwards, his musical career saw a downfall in his creation except for few of his albums releases (when he won Grammys in 1991 and 1994). Even though he was not very creative during 80's and 90's, Ray was still successful in marking his presence in the music world through few new albums, various deals he made with Recording groups and the Grammys he won for the country albums. Although slowed down, but he never ceased to give musical masterpiece albums during the rest of his life. He even tried his luck on screen by doing small roles in few serials, movies and commercials. In his musical career, Ray picked up 12 Grammy Awards, few Emmy Nominations, a couple of Lifetime Achievement Awards, secured place in various halls-of-fame and many more achievements on his name. His albums are considered among the most successful musical performances given by any individual musician. The great musician died on 10 June 2004 from an acute liver disease. Before he died, he just had finished work on an album for Concord Records with musical maestros like Norah Jones, Elton John, Bonnie Raitt etc. Check out the Jamie Foxx "Ray" movie... the cat does a great rendition of Ray Charles, and he won an award for his performance! Back to Ray Charles Biography and other Jazz Cats!